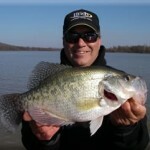 MRO Crappie Academy | Barry Morrow, Touring Pro | "Get Him inThe Boat!" My trip to Truman Lake with Coach Morrow was one of the best fishing experiences of my life. I was 12 or 13 years old. My sister, Heather, was 9 or 10. And up to that time my angling expectations were to simply put a worm on a hook, cast, and wait for the bobber to pop. If I got a bite – great. If I actually caught a fish – Wow! I can remember we started with a 20-minute boat ride followed by fisherman’s nirvana. I recall, Heather and I, throwing out our line and the next thing I know, Heather and I are pulling out crappie left and right. Too many fish to count, especially for a 9 and 12 year old. After this went on awhile I started to feel bad for Coach Morrow and my dad. The quicker they took off the fish, the more often one of them got smacked in the head by a flailing crappie. Looking back, this was truly one of the best experiences a kid could have. Enjoyed lots of action with this first rate guide. Barry, Jim and I had an absolute blast, thanks to your ability to put us on the numbers and quality of fish we caught. I’m not certain if the laughs and the time away from the daily grind was more fun than catching all the fish. Thanks so very much for making our trip! You, Lolly and Todd really made the trip memorable.Thanks again, Barry; YOU ARE THE BEST!! Barry was just like another buddy on the lake but with alot of knowledge. If You Want a Time To Remember, Call Barry, NOW! Barry took my son, my dad and myself fishing in early june. the time we had was just unbelievably fun. The fishing was excellant, but the experiance I had with Barry and the three of us topped everything! If you want a time to remember, call Barry. NOW!!! My Grandson Had a Great Fishing Experience! Barry did an excellent job of assisting my grandsons with a Great Fishing Experience. One they will remember for years. Appreciate Barry being very patient while teaching and making our trip very enjoyable. Thanks!!! Coach, Thanks for the New Techniques! You Know How To Find Them! I would like to thank you Barry for not only a fun but educational fishing experience. 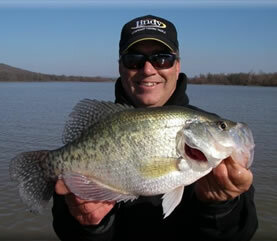 Lake Eufaula holds some big crappie and there is no doubt you know how to find them. Hope to be back soon. Thanks again for a wonderful trip! Had a great time fishing with Barry. He taught me alot about jig fishing. Thanks for everything hope to do it again. After 3 tries we finally had a guide trip with Barry. We had a great time fishing. Another great trip with you, Barry. I have fished with guides from Venezuela to the Bahamas and Hawaii to Florida, and now Oklahoma.I have never seen a more class act than Barry Morrow. I also think he may be the best crappie fisherman I have had the pleasure of fishing with. If you are on the fence about going with Barry, get off it and book a date. Barry is awesome and we had a fantastic two days of catching and learning. If you want to have a fishing experience that you’ll never forget, then you need to book a trip with Barry! Thanks, Barry, for making our 35th anniversary so special! The Man Can Catch Fish! Great trip!! Barry is a pro for sure. Caught lots of Crappie just as he promised. He is a magician at getting jigs unhung. Nice easy-going guy. Thanks !! I think you have what every fisherman wants. We caught lots of fish despite the August heat wave. Barry was very patient, professional and taught us techniques we can use. Will definitely use his guide services again! Thanks Barry! Barry is the Man! We caught several nice sized Crappie in undesirable weather conditions (this is exactly what we were looking for; anyone can catch a fish in the spring). He is a wonderful Guide and teacher. This defiantly was a pleasant and memorable experience. Highly recommended! Thanks for the great info. on catching crappie presented at the tub yesterday at the tackle show. Was a pleasure meeting you and getting to visit with you. Looking foward to booking a trip with you in the near future. Barry can find the fish! We had bad weather to work with and was unsure if the trip was going to work out, but he got us on the fish and we had a blast!! We will be back..
My son-in-laws and i went fishing with Barry and had a blast. The weather started out gloomy but ended with sunshine and we brought home 102 slabs of crappie. Thanks Barry for the memory. Barry, Thanks for a great day. 40 nice crappie! It was a pleasure and look forward to another day of fun soon! Hello! I’m Glad You Stopped By Our Guestbook Page! Give Me a Call and Let’s Go Fishing!